You can use the Wholesale Order window to make cross trades on CME when connected to CME Gateway 7.17.45 or higher. CME requires that members send a "quote request for cross" message prior to performing a cross trade. This message is broadcast to all market participants and is visible in the Quote Audit Trail. At CME, certain products may be eligible for cross trades but not eligible for “quote request for cross” (RFQ). If not eligible for RFQ, you’ll get a reject message from the exchange; however, the cross order can still be submitted for the product. Contact the exchange to ensure that your product is eligible for “quote request for cross”. Users cannot modify (Change or CancelReplace) a sitting cross order. The CME Gateway rejects the Change action with a message "Unsupported order_restrict code". For CancelReplace, the order will be deleted, but the Add is rejected by the gateway with the same message. The only actions permitted by the gateway for a sitting Cross order are "Inquire" and "Cancel".In X_TRADER®, order passing for cross orders is not permitted. Enable RFQ in the Market Grid and open the Quote Audit Trail to view “quote request for cross” messages, which only appear in the Quote Audit Trail. Contact the exchange to ensure that your products are eligible for RFQ. The CME Gateway version does not support wholesale trades. Executing account number/name as agreed between the broker and clearing member firm.Required for cross trades. The account field is seeded with the account present in the Order Pane. Sets the account type for the CTI/Origin code mapping for the submitted order. 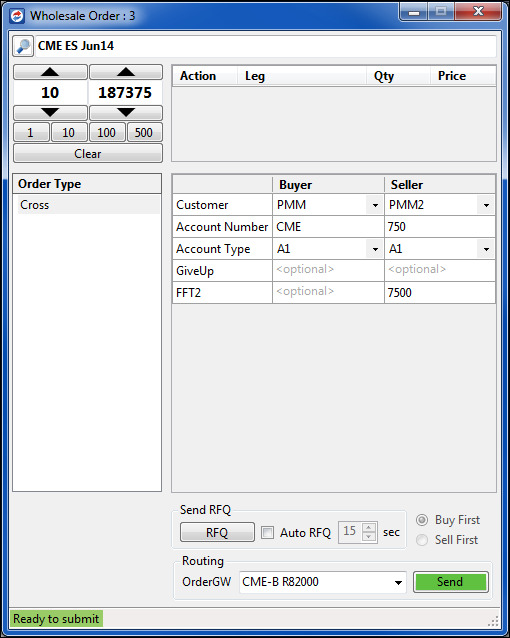 Account type-to-CTI/Origin mappings are defined on the CME Gateway, but the account type is submitted via the Wholesale Order window. Sets exchange member ID of the Giveup firm. This field is optional. Sets the customer specific information. This field is optional. Click the RFQ button or the Auto RFQ checkbox to use the timer before submitting the order. The two features work independently. The RFQ button sends a “quote request for cross” immediately. Auto RFQ sends a “quote request for cross” after you click Send, then submits the cross order when the timer expires. Both “RFQ” functions are for wholesale orders and work differently than the “RFQ” (request for quote) functionality in the Market Grid. If Auto RFQ is checked, the “quote request for cross” is sent and the timer counts down. When the timer expires, the cross order is submitted. Review the Confirm Order window and click Yes to submit the order.